The Mizuho OSI Patient Helper is designed to allow the patient to take additional control of their own mobility while the nurse does less physical moving of the patient. Features include convenient caregiver access to adjustments and the ability to lock the trapeze in place where it is most beneficial for the patient. The Mizuho OSI Patient Helper may be quickly removed from the bed with a turn of a knob. This means quick and clear access to the patient’s head in an emergency. You can also quickly remove from one bed to place on another. The Mizuho OSI Patient Helper is designed to assist patient mobility. 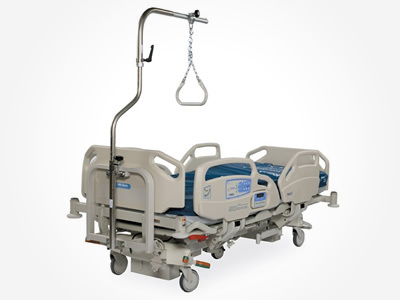 The Patient Helper is particularly useful to assist with repositioning in bed, transfers to transport platforms and bed egress. The Mizuho OSI Patient Helper requires an adapter bracket from Hill-Rom (P/N P844A48) and a Patient Helper Sleeve P/N 3423-1. Q: What do I need to attach a Mizuho OSI Patient Helper to my Advanta (not Advanta II) or Advance Bed? 1) Hill-Rom Bracket P/N P844A48. This is purchased from Hill-Rom. 2) Adapter Sleeve. The Adapter Sleeve is provided standard with Mizuho OSI Patient Helper P/N 3423. The Adapter Sleeve may also be purchased separately from Mizuho OSI using P/N 3423-1. Hill-Rom also provides an Adapter Sleeve. Make sure you ask Hill-Rom if they are providing the Adapter Sleeve or not! 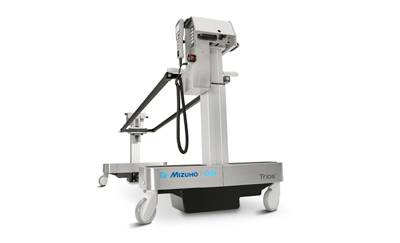 Q: What is the weight capacity of the Mizuho OSI Patient Helper? A: 200 lb. (90kg) safe working load. Remember that Patient Helpers are assist devices and are not intended to suspend a patient off the mattress. As such, larger patients receive benefit from the Mizuho OSI Patient Helper. As an example, a 300 lb patient applying 2/3 their body weight to the trapeze will receive the benefit of repositioning in bed, assisting bed egress or patient mobility. Q: How tall is the Patient Helper? Will it fit through doorways? A: The Mizuho OSI Patient Helper has a low profile of 72”. The actual height varies with bed adapters, but the overall profile is the lowest on the market. To ensure clearance through doorways lower the bed height when transporting. Q: If I have more questions, who should I call?